Android 2.2 powered Galaxy Tab was introduced by Samsung recently and is already touted as the most promising Apple iPad rival yet by many industry experts. 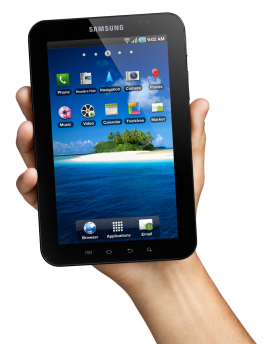 With its latest entry into tablets, Android is spreading like wildfire. Latest Android 2.2 is on a roll. Finding its place into almost all new smartphone devices that has recently been announced or released, Android may indeed become the most popular mobile phone OS by 2014 as predicted by Gartner. Samsung Galaxy tab features all new Android 2.2, is smaller and lighter than Apple iPad, has almost twice the RAM, possess expandable microSD storage capabilities and even have two cameras: a 3.2-megapixel camera that faces outward and a front-facing 1.3-megapixel camera, which can be used for video calling, chatting etc. Another big advantage of Samsung Galaxy mobile phone is that, it's latest Android 2.2 actually supports Adobe Flash. This is a huge plus when you consider the fact that, there are no Apple iOS based devices that support Flash currently.